Have you ever wondered the difference between a regular bull market and a secular bull market - or, for that matter, a regular bear market and a secular bear market? In just a few moments, you will learn the difference between each and what they can mean for your portfolio. As explained in the special article Understanding Bear Markets, you discovered that a bear market is when the overall level of stocks has fallen substantially with 20% losses being the unofficial line that must be crossed. Bull markets, in contrast, consisted of stock prices increasing more than 20%. When we talk about the stock market, we are typically referring to one of the major indices such as the Dow Jones Industrial Average or the S&P 500. In secular bull markets, stocks tend to rise more than they fall with any setbacks being more than compensated for by the subsequent increase in stock prices. 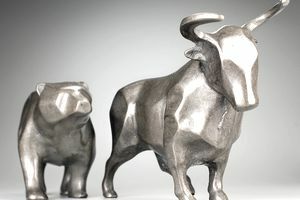 The most recent and famous secular bull market consists of the period between 1983 and 2000 when the United States entered into the greatest economic expansion in human history after Federal Reserve Chairman Paul Volker took a metaphorical 2x4 to the back of inflation, allowing the country to escape from the inflation-induced malaise of the 1970's. Although there were certainly bear markets contained within the period, such as the Black Monday crash of October 1987 when stocks suffered the biggest one-day drop in history and the dot-com bust of 2000, the overall trend was such that an investor who bought and held stocks would have made a great deal of money, drastically increasing his or her real purchasing power, thus making a better life possible. Think of secular bull markets as two-steps-forward-one-step-back in that, though there are setbacks during a secular bull market, you are always progressing forward. In secular bear markets, on the other hand, the overall trend is one of wealth destruction as the real purchasing power of stocks decline more than they advance. The most recent secular bear market was 1966 through 1982. Although stock prices fluctuated wildly, they ended the period about back where they began. The damage came from inflation, which caused investment values to drastically decline in terms of purchasing power. That is, you were better off in some cases buying tangible goods such as real estate or metals. Indeed, Warren Buffett once lamented in a letter to shareholders that in a ten year period during this secular bear market, all of the work of the management teams that were building Berkshire had allowed each share to merely maintain the purchasing power of one ounce of gold. Nevertheless, secular bear markets can represent great opportunities because you can often acquire businesses and stocks for much less than they would be worth in better times. Buffett's $10 million investment in The Washington Post sat on a 50% loss for three years during this period despite his estimate that he had only paid $0.25 on the $1.00 for the company's real, or intrinsic, value. Today, that same stake is worth north of $2 billion - a 2,000% rise. It's a great mistake to get hung up on secular bull markets or secular bear markets because you can't control when you are born or into what type of market you find yourself during the prime earning years of your career. Going back to our earlier example, men like Warren Buffett and Charlie Munger made all of their initial fortune during a secular bear market proving that if you do intelligent things, focus on getting value for your money, constantly educate yourself, and avoid wipe-out risk, you have a very good chance of increasing your family's standard of living and lifestyle. Don't become a victim of the markets. There are always intelligent things to do.